It’s been years since I’ve been to Italy. It’s one of the few travel destinations that I actually miss. What I love about Italy is even the fast food is prepared using only the freshest ingredients. This is in stark contrast to the fast food we cherish in North America. Frozen, processed food that's slapped together in a hurry when we order it! Now doesn't that sound yummy! This why I like to think like my Italian ancestors when it comes to burgers. I prefer to make them myself and put my own cooking passion into each and every patty. Making burger patties is really easy and quite fun! I love infusing them with different flavors...hickory, honey garlic, extra-spicy...there are no limits. Next time you have a craving for a burger, don't just run to the closest fast food establishment. Try putting on some nice Italian music and let it's passionate melodies dance around your kitchen while you prepare your own freshly made, preservative-free and juicy home burgers. 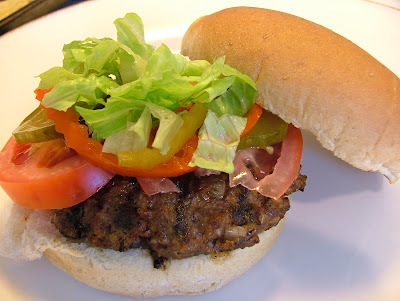 Below is a tasty burger mixture with some Italian flair. I encourage you to experiment until you find the burger that fit's your style!